Summertime and the living is easy, and the air is buzzing suddenly with the sound of a thousand boat engines. We really didn’t think we’d have a ghost of a chance of getting a spot at Soing. Although we did get lucky once years ago but haven’t managed to find a spot since. Two of the things we derive particular joy from while living on the water are lying in bed till late, and getting out on the water early. Since these are somewhat conflicting aspirations and most don’t share our enthusiasm for the early thing, when we slipped quietly away with the mist still rising off the water, we were quite possibly doing so with a several hour head start on the rest of the sleeping port. As it turned out we were the first to arrive at our perfect little mooring, secluded, beside the barrage with it’s sparkling running water to lull us into snooze time should we need it, and a great shady tree to contemplate the afternoon beneath. 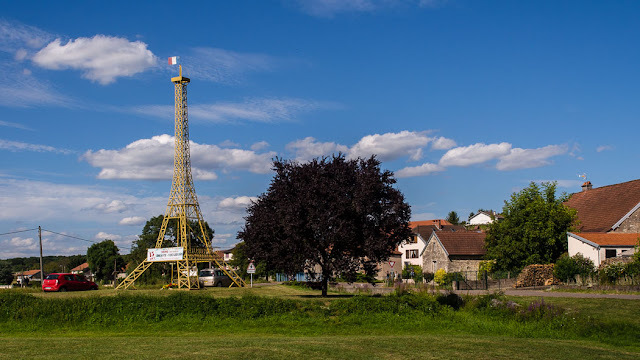 We did walk into the village of course to visit the Eiffel Tower replica, which is a nice try, but could never be mistaken for the real thing. The cows grazing beside it are a give away, and it’s smaller, and doesn’t have the curves, or the proportions. It is unique though in all of France we think because it has been maintained. This is such a rare occurrence that there is even a plaque on it which proudly proclaims that in honour of it’s twentieth anniversary (in 2012) it was cleaned and painted, no doubt with some paint donated by a combined harvester repairer which explains the slightly different hue to that of the original. Tiny criticisms aside, if one stands back and squints……..